Abbeycwmhir (Abbey in the Long Valley) is a village situated in the centre of Wales, nestled amongst the Cambrian Mountains, in the old county of Radnorshire. It is steeped in history and natural beauty as well as being virtually undiscovered by the modern world. A warm welcome awaits you on arrival, from the small vibrant predominately farming community. You stay the night here at a welcoming guest house called Laurel Bank which offers quality accommodation to passing Freerein riders. Your friendly hostess at Laurel Bank is Meryl; it has been reported by many a happy Freereiner that the home cooking here is a real highlight! 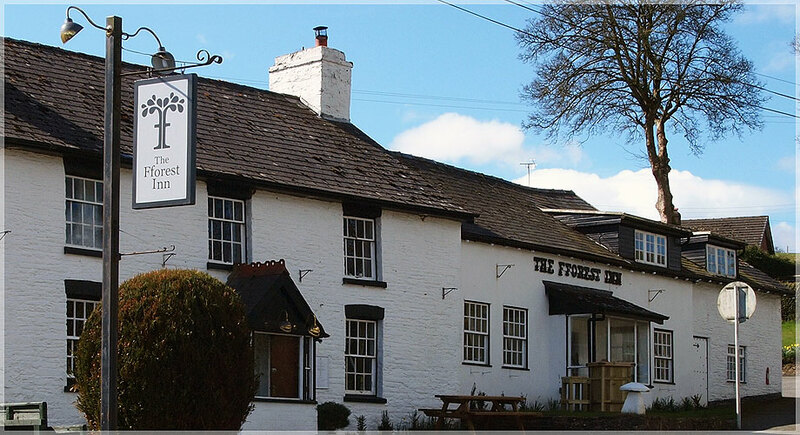 For those with the energy to venture out, a visit to the Happy Union Inn is highly recommended. The inn is a Grade II listed building, however the age of the building remains something of a mystery along with its name and sign, which depicts a rotund gentleman riding a goat, holding a plate of cheese and sipping a tasty beverage. In the middle of the village on the banks of the Clywedog brook amidst magnificent scenery are the ruins of the Cistercian Abbey which was built in 1143. It was the largest abbey in Wales but was never completed, and although only some walls now remain you can imagine how incredible it must have been in its heyday. It is believed that the headless body of Prince Llewellyn, the last native Prince of Wales is buried here, and there is a memorial stone for him in the ruins of the Abbey. Your aimiable Freeerin mounts spend the night munching grass in the ruins of the Abbey which is about a five minute walk from Laurel Bank Guest House. The village also boasts an impressive church and a 50 room Elizabethan-style house built in 1833 which is open to the public. You will need to be riding a trail of 5 days minimum to visit this fascinating place.